We can confirm that Simon Chapman is on their Internal Communications and Marketing Services graduate programme, as he talks about being “selected by adidas and LOCOG to carry the Olympic torch for the London 2012 Olympic Games.” on his LinkedIn profile. UPDATE: Mark Newton-Jones was later added to the torchbearers site with the same story. Newton-Jones is the boss of Shop Direct. As for Clare Ennis and Lucy Speakman? We have no idea. Do you? 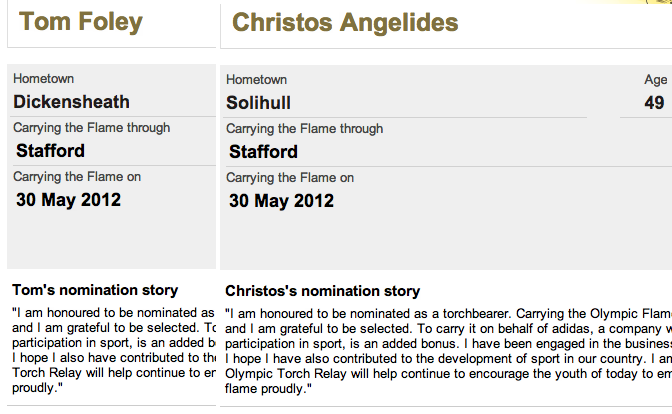 There are 21 torchbearers in total who mention Adidas in their nomination story (only 6,000 of the expected 8,000 torchbearers are listed on the official website, and 5,890 of those have nomination stories). Anthony is a store manager; Ross is a member of the IT team (“The warehouse is a critical component to adidas and ensuring that the systems are available 100% of the time is the only way all departments in Operations can meet their targets”). And there’s a significant proportion from the north west of England, with over half from that region, including 5 from Manchester. Unlike torchbearers as a whole, where under-20s dominate, around half are in their thirties, and only one is under 24. UPDATE: adidas admit company bosses were chosen to carry the Olympic torch. Full data available on Buzzdata here. This entry was posted in Data and tagged adidas, Mark Newton-Jones, Shop Direct, torchbearers by Paul Bradshaw. Bookmark the permalink.